I do not know what she means. “A freelance editor? Sounds interesting. I hire one of those.” Even though I pretend Denae is my own editor, she really isn’t. I do love my real-life editor, though. She catches all kinds of errors my beta readers and I have completely missed. “I’m curious if you can see the romance rhythm, as you called it, in your friends’ real-life stories.” As real-life as they are, considering they’re fictional to you and me. But they’re real to Denae. I keep silent and shake my head, pretending I have no idea what she’s talking about. Wait… Denae wants Trevor to notice her? I’m a romance author. 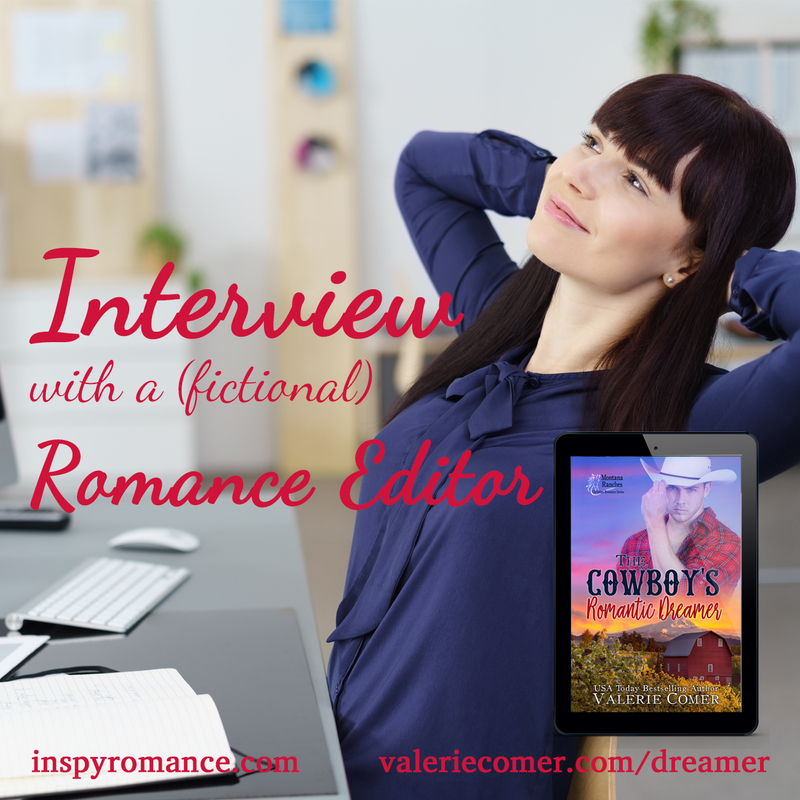 I’m pretty sure I’m up for the challenge of putting a guarded cowboy and a bubbly romance editor through their paces to find their own happily-ever-after… even if Denae might not approve every step of the process. 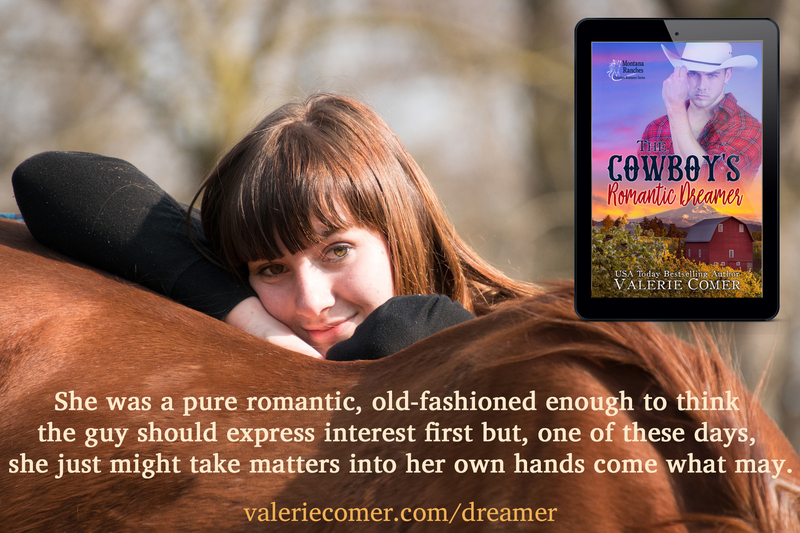 The Cowboy’s Romantic Dreamer releases tomorrow on Amazon only, and is available to borrow in Kindle Unlimited. Pre-order today to save 25% off the post-release price! 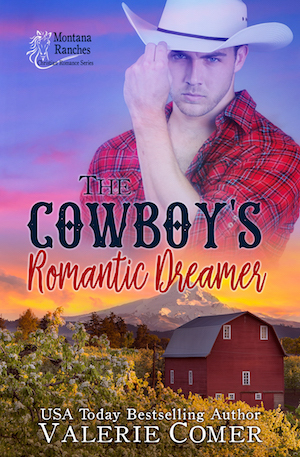 Burned by love, Trevor Delgado has pushed aside all his personal dreams in favor of expanding his family’s ranching empire in western Montana. That’s what any hardworking, dependable firstborn son should do, right? He’s not lonely, just solitary. All he needs is a saddle beneath him, the mountain breeze on his face, and no time to think. Editing hundreds of romance novels has made Denae Archibald an expert on love. She knows how it’s supposed to go… and tall, dark and mysterious Trevor Delgado is exactly her kind of hero. If only her issues weren’t enough to send any worthy cowboy galloping for the range. 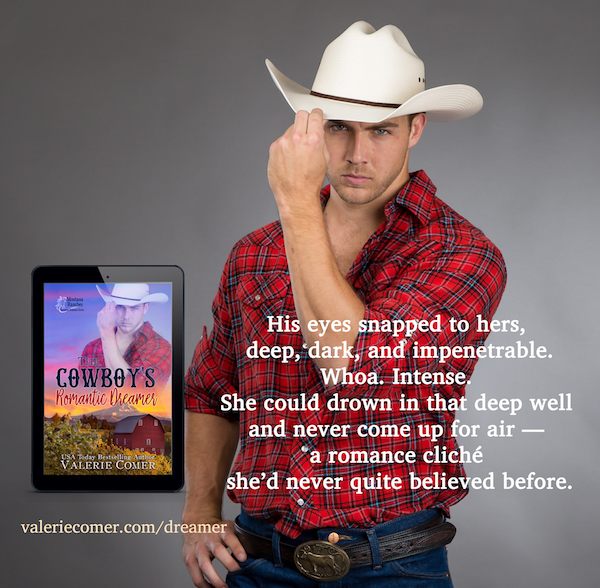 How can the romantic dreamer and the guarded cowboy kindle their hopes for a future together? What about you? Would you class yourself more as a romantic or a realist? Hi Valerie! Best wishes on your release tomorrow. Yesterday we started with winds and sleet and received an inch of snow. A friend says we have a new season “sprinter.” Snow, snow go away! I am a realist – part nature / part of my German heritage. Blessings. Sprinter, huh? I’ve seen photos of your part of the world lately, and I can see why you’d like the -inter part of that word to sprint away! Here, we haven’t had snow, but it isn’t all that warm, either. The snow line on the mountains is significantly lower than ten days ago! SPR (spring) INTER (wINTER) = Sprinter. Spring keeps being dragged down by Winter ( which like a bad house guest refuses to leave. Mother Nature is having a difficult time with her stubborn child. Most Michiganders don’t sprint to warmer climates, we just want the seasons to play nice. I’m a realist, but I do enjoy reading a good romance. Thank you! I think I’m far more a realist than a romantic, for all I write romance! Best wishes!. I have always been a romantic.. I am a realist most of the time, but the romantic side does arise from time to time. That’s a really good way to put it, Mary! Hello. Best wishes oh your release. I am so a romantic. Have always been. I hope you’ll enjoy Denae’s journey and find it satisfyingly romantic! How fun, I loved meeting Denae, and she is a wonderful romantic! Thanks for the pre-order :) And balanced is a good way to be. Thanks as always for writing. I’m looking forward to the release tomorrow. I have it preordered. I love reading inspirational romance but am much more of a realist. Thank you! And that’s a great combo! I think I’m somewhere in between but leaning toward realist. I lean that way myself… but write romance. So I’m confused!